The real money is made in the Data, not the Narrative. 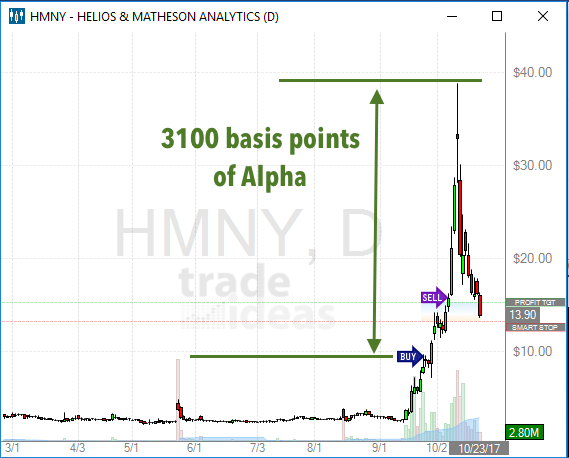 When the Trade Ideas Artificial Intelligence Virtual Analyst (Holly) triggered an entry to buy HMNY on Sept 26 at $9.43, chances are you weren’t reading about this on wsj.com or getting alerted to a potentially profitable event on CNBC or Bloomberg TV. More than likely, if you were engaged with traditional media sources, you were probably consuming their latest guesses about what the Federal Reserve may or may not do next, which industry Amazon is gutting next, or whether or not passively investing in FAANG stocks will help you outperform the indexes over the next 5,10, 15 years. Yawn…. Meanwhile, over at Trade Ideas, our customers are getting the REAL news — price and volume action — in real time, as it happens. Our subscribers are being served actionable ideas uncovered by millions of calculations being done behind the scenes on our servers at it scans 7000+ stocks and measures the data against hundreds of filters — in nanoseconds. And the alpha being generated is astonishing! The “news” being served to you by a human via traditional media is already old news (if it’s even news at all!) when you’re seeing the headline flash on the crawl at the bottom of your TV screen. And by then the trade has already been missed. So that HMNY trade alerted on Sept 26? Well, swing traders could’ve entered at any time on that trading day, and by the time the media jumped into the story two or three weeks later, you’d already have had an opportunity to capture a large portion of as many at 3,100 basis points in pure Alpha — with a capital A! You’d have to have been Mr. Superman Lottery Winner to have actually gotten out at or near the top tick in this stock, but the fact remains there was ample opportunity for fat gains in this stock while taking zero heaton your position. Even today, after two weeks of serious pullback, the stock still hasn’t come close to the low of the day you entered, or even come back to anywhere near break even. Is AI infallible? Absolutely not. This chart offers a case in point. You likely noticed a “Sell” arrow on the chart in the middle of the parabolic run. When viewing charts on Trade Ideas, our AI engine only displays where the entry was triggered. The exit is omitted because Traders most often use discretion on where to exit their winning and losing trades. In the case of HMNY above, two weeks after our entry, AI triggered a Short entry denoted by the “Sell” arrow. Taken in isolation, if you had no position on when the short trigger signaled and you decided to get short you likely lost money. Hopefully, you’re utilizing at least some rudimentary rules to keep your positions sized properly and your stop loss orders appropriately placed and honored. Those who don’t likely learned a very painful lesson. This is a perfect example that trades entered via our AI engine (Holly) are not guaranteed to be successful (no trade is) and therefore you must stay on top of them with a plan. Holly only provides a statistical edge backed by a robust backtesting and optimizing regime. Trim long and trail a stop? Obviously, it’s easy in hindsight to determine the proper course of action to take. But for me, the lesson here is: Stick with your original trade and let opposing signals be a warning to start piecing out profits and trailing a stop loss for the rest. Had you done this, a trade like this could’ve made your month and maybe your year. But back to where we started this story. News might be the catalyst that drives short term price action, but you’re not going to find the story in time via traditional news sources. You’re going to find it in the volume and price action of the stock. And no human can continuously scan and parse the firehouse of exchange information faster and more efficiently than machines. This is the beauty and magic of Holly, the Trade Ideas Artificial Intelligence engine. We’re excited for you to learn more about how Holly is completely changing the game for traders and investors. Start here and use promo code: CHICAGOSEAN to take advantage of 15% off the price of an annual subscription. For information on other subscription plans and prices, head here.